Sober Look: Let them eat MBS... and now more notes and bonds? Let them eat MBS... and now more notes and bonds? 1. The Fed is on target to take down roughly 2/3 of mortgage backed securities (MBS) supply this year (according to Goldman). 2. 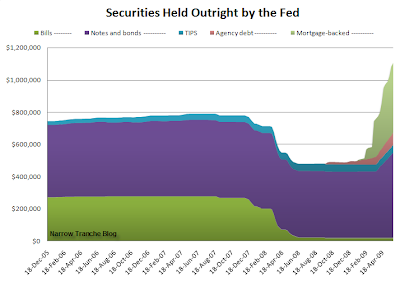 Given that the program of buying MBS is no longer having the desired effect (to bring down mortgage rates and stabilize housing), the Fed will move to buy more Treasuries - reducing (or attempting to reduce) yields.